The members of the Women’s Committee of the University of Pennsylvania Museum of Archaeology and Anthropology were inspired to collaborate on one of the best books I have had the pleasure of acquiring this year. Culinary Expeditions introduces its readers to culinary artifacts from around the world, culled from the Museum’s amazing collection. Each artifact is accompanied by a recipe that reflects the culture of its provenance. All proceeds from the sales of this book will directly benefit the Museum. In our increasingly internationalized world, this book is the perfect gift for any occasion. Learning about each others’ cultures and foods helps us all connect with each other. The book takes its readers to Africa, Asia, Egypt, Greece, Mesoamerica, the Near East, North America, and Rome. Along with the artifacts, the book explains about the special fruits, vegetables, and spices that are indigenous to each region of the world. Some of the artifacts photographed are the foods themselves, such as bread that was discovered in a pyramid in Egypt. The Women’s Committee’s members tested each recipe twice for ease of preparation and taste. It was exciting for me to try the foods that were on our continent before it was colonized. I was very intrigued by the similarities and differences of the foods of the Native Americans in North and South America. 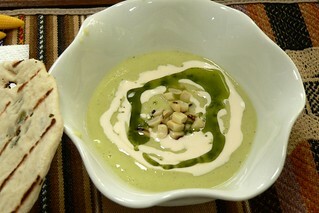 Just in time for the warm weather, I prepared the chilled corn and avocado soup from Mesoamerica. Just by assembling the ingredients, I learned much about this civilization. It is now possible to source authentic Native American ingredients from the Native Seed Bank. Mince the onions and garlic. Place the corn kernels, water, onions, garlic, and about 1 teaspoon of salt in a large pot. Bring to a boil, and then simmer for about 30 minutes. Turn off the heat and allow the corn to cool. Place the corn soup in a food processor. Add the chili pepper, avocado, cilantro, and lime juice. Place the soup in the refrigerator for about one hour. Serve with a dollop of sour cream, a drizzle of olive oil, and a sprinkle of minced cilantro.